Siena came into last season as the heavy favorite to win the Metro Atlantic Athletic Conference, and the Saints certainly didn’t disappoint. They rolled through the conference at 17-1, winning the title by four games over Fairfield and five games over Iona. Saint Peter’s was the only other team to finish above .500 in MAAC play. However, Fairfield nearly knocked off Siena in the conference tournament, as the Saints needed overtime to hold off the Stags. Siena then failed to win an NCAA tournament game for the first time in three years, falling to Purdue. Could there be a changing of the guard in the MAAC this season? 1. Fairfield: This could be a team that wins a game in March if everyone stays healthy. 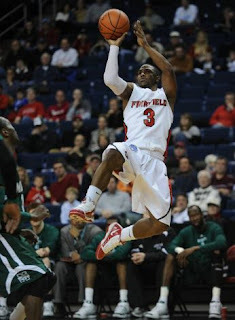 Derek Needham is one of the premier mid-major point guards in the country. 2. Siena: The Saints lose a ton from last season, but they return guard Clarence Jackson and big man Ryan Rossiter, one of the better inside-outside tandems around. 3. Iona: Head coach Kevin Willard left for Seton Hall, but new head man Tim Cluess returns all five starters from last season’s third-place team. Scott Machado is the go-to-guy. 4. Saint Peter’s: If Wesley Jenkins comes back fully healthy, he and Nick Leon form one of the best guard duos in the league. Ryan Bacon provides balance up front. 5. Rider: Without Ryan Thompson, the Broncs will need other players to step up. Forwards Mike Ringgold and Novar Gadson are solid, while Justin Robinson can shoot. 6. Canisius: The Golden Griffins have to replace Frank Turner, but four starters return, including guard Julius Coles, and they also bring in South Florida transfer Gary Belardo. 7. Niagara: Four starters are gone from last season, including Tyrone Lewis and Bilal Benn. Anthony Nelson and UNC-Wilmington transfer Kevon Moore will be the key cogs. 8. Loyola University Maryland: Jamal Barney leads the way for a team that had a disappointing finish last season. Forward Shane Walker provides balance on the interior. 9. Manhattan: If Rico Pickett had return, the Jaspers would have likely improved. As it stands, Alabama transfer Demetrius Jemison and Andrew Gabriel are the main men. 10. Marist: The Red Foxes won just one game last season, but they return four starters. Sophomores Candon Rusin and Devin Price will have to step up in a big way on the perimeter.